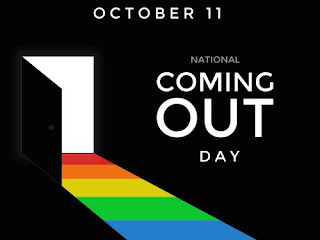 Per norm, I am a little late, but yesterday was "National Coming Out Day" for LGBT women and men. Also "per norm" my coming out was basically backwards. The first time I told anyone I was a "transvestite" came when I was in the Army in Germany. I had a very close knit group of three friends, one of which included my future first wife. My disclosure came circa 1974 after a Halloween party when I came dressed as a slutty prostitute. Looking back, it's hard for me to remember how I was able to acquire the shoes, clothes, makeup and wig to even attempt to pull it off. Seeing as how this was way before "Don't ask, don't tell" time in the military, I'm lucky I didn't get reported to the higher-ups. Maybe it did, but I only had less than six months to go before discharge and hassling me may have led to more problems than worth. Of course too, this was way before the transgender term had been invented. At any rate, later on in life, one of the guys I came out to ended up coming on to me, the other remained a friend for years and as I said the woman involved ended up marrying me. Ironically, outside of an ill fated attempt to come out to my Mom when I was discharged, coming out to anyone else didn't happen until I came out for good. I hate it when coming out leads to a coming on. I guess the come on ends up being a coming out for the other one. Interestingly, it was a married cis woman who came on to me after I'd come out to her. Yes! I had that happen to me too :) Quite a bit of fun.